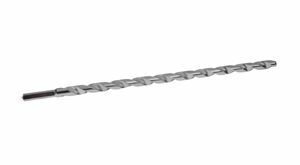 Straight shank bits, or Hammer bits, are carbide-tipped bits used for drilling holes in concrete, brick or block base material. The tip of the bit is made out of carbide. These carbide-tipped bits are used in mechanical hammer drills. The straight shank bits are attached to the hammer drills via a chuck. The straight-shanked bit is used in a Jacobs style chuck (a chuck in which a key is used). Our straight shank bits are American made of premium quality steel and carbide. Straight shank bits are available in diameters from 1/8" to 1-1/2" and up to 24" in length.